Media caption"It was a nightmare, it wasn’t safe enough to drive"
BMW is extending a UK recall of its cars after the BBC's Watchdog found that vehicles could cut out completely while they are being driven. It is recalling 312,000 vehicles: the BMW 1 Series, the 3 Series, the Z4 and its X1 petrol and diesel models made between March 2007 and August 2011. BMW initially recalled 36,410 petrol cars last year over safety issues. The German carmaker initially recalled cars in the UK after Narayan Gurung, who was travelling with his wife on Christmas Day in 2016, died when their Ford Fiesta crashed into a tree to avoid a broken-down BMW in Guildford, Surrey. One BMW owner, Mwape Kambafwile, told the BBC how his BMW 3 Series car had cut out completely while he was driving in December 2016. "I just thought to myself if I was driving on the motorway with my family in the car, that could have been very dangerous," he said. 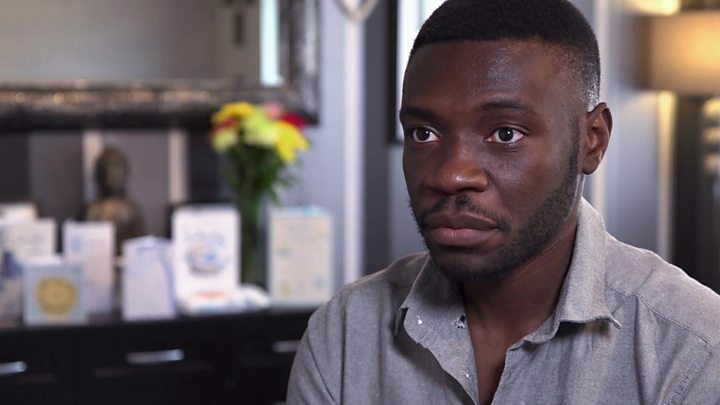 Mr Kambafwile said he took his car to BMW who called the next day to say that they had found the fault, which looked like "the cable had burnt out and no current was passing through the fuse box". BMW allowed Mr Kambafwile to take the car home without any warning not to use it, he said. He refused to drive the car and was furious to later discover that petrol versions of the same vehicle had been recalled for the same fault. It recently emerged that BMW had failed to tell the UK's Driver and Vehicle Standards Agency about the electrical fault in some of its cars that led to the death of Mr Gurung. BMW said it had worked with the DVSA and rejected suggestions it had ignored instructions or provided incorrect information. An inquest revealed that the carmaker had received complaints of an electrical issue that caused a total power failure as early as 2011. BMW recalled 500,000 cars in the US in 2013, as well as in Australia, Canada and South Africa. Commenting on Watchdog's investigation, BMW said: "We now recognise that there may have been some cases of similar power supply issues in vehicles not covered by the original recall. BMW said that it will open a customers' complaints line and will contact affected owners directly.